Rachel Von | The Journal Gazette Snider's Payton Gorman, left, battles Carroll's Audrey Freeland for the ball during the second quarter of a Class 4A DeKalb Sectional game. 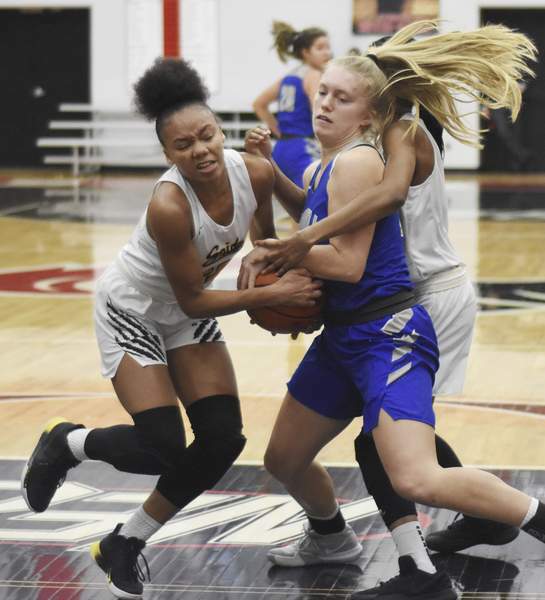 WATERLOO – The polar vortex that wreaked havoc on mail service, schools and life in general all week worked out quite well for the Carroll girls basketball team. With their Class 4A DeKalb Sectional opener postponed from Tuesday to Friday night, the Chargers used the extra three days and two additional practices to better prepare for a Snider zone that had given them fits just a week ago. The result was a 49-42 victory and a date against East Noble (4-19) tonight in the second semifinal of the DeKalb Sectional. Northrop (12-9), which beat DeKalb 54-43 in the first game Friday, faces North Side (5-16) at 6 tonight in the first semifinal. The championship will be played at 7:30 p.m. Monday. The Chargers (12-10) gladly accepted the delay in going for a third straight sectional title, especially since they had more time to rebound from a 46-37 loss to Snider in the regular-season finale Jan. 25. Although daily school routines were on ice, practices and watching film remained a constant. The Snider zone killed the Chargers in the first quarter Friday, as well. Carroll missed its first six shots, made just 2 of 11 in the quarter while committing six turnovers as the Panthers raced out to a 14-5 lead. The advantage expanded to 17-5 when junior Jada Kepney hit one of her three 3-pointers. After watching his team miss its first five shots in the second quarter, Redding called a timeout and switched the offense, spreading four players high outside the zone. Defensively, the Chargers doubled freshman post player Niesha Anderson and got some transition baskets when it was the Panthers who went cold and hit just two shots in the quarter. After Kepney's 3, Snider (8-12) went 3:12 without a basket, then went the last 3:45 of the quarter without a point. Meanwhile, Carroll went on a 16-2 run, led by seven points from junior Malia Williams and five from junior Olivia Hoeppner. Snider tied the game at 25 late in the third quarter, but Carroll sophomore Parrett, who had a game-high 17 points, scored twice in transition and sophomore Delane Sheets scored with three seconds left to make it 31-25. Carroll used a 7-0 run early in the final period to built a 38-27 lead, but Kepney hit two more 3-pointers and Da'Leshia Davis had four of her team-high 13 to cut the Carroll lead to 42-41 with 1:31 to go. Parrett answered inside and Davis struggled at the free throw line, hitting just 1 of 4 in the final 1:07. Meanwhile, Hoeppner made 5 of 6 free throws in the final minute to help the Chargers pull away. Free throws were a huge factor as Snider hit just 3 of 12; Carroll made 16 of 21. Hoeppner finished with 13 and Williams 11 for the Chargers. Kepney added nine for the Panthers.